Home » Others » No Independent Probe On YS Jagan Attack? No Independent Probe On YS Jagan Attack? Visakhapatnam: Senior leader of the YSR Congress party (YSRCP) Botsa Satyanarayana criticised Andhra Pradesh chief minister Nara Chandrababu Naidu for joining hands with the Congress to save the Telugu Desam Party (TDP) from losing prominence. Speaking to media here , he said that Chandrababu was eager to forge an alliance with a party that he had accused of doing injustice to the State. The alliance is not an attempt to save the country but to save the leaders of the Telugu Desam Party (TDP), he added. Botsa said that the TDP's alliance with the Congress was an excuse to evade questions on the progress made by the govt in the last four years. Chandrababu, who is known for his prowess of manipulating the administrative framework in the government, is now speaking of saving the democracy, he added. "The YSRCP was formed as a result of its resolve to fulfil its promises. Even as the Congress during the UPA rule caused troubles and the BJP along with the TDP denied Special Category status (SCS) to the State, the YSRCP always stood by the public," he recalled. The YSRCP leader further said that it was Leader of Opposition in Andhra Pradesh Assembly YS Jagan Mohan Reddy who demanded m SCS despite Chandrababu's acceptance of the special package. The TDP Chief will in the near future pay the price for his irregularities and rampant corruption, he remarked. After calling CBI the Congress Bureau of Investigation, Chandrababu shamelessly joined hands with Rahul Gandhi,he added. Botsa found fault with Chandrababu for not condemning the attack on YSRCP Chief YS Jagan Mohan Reddy at Viskhapatnam airport. Adding that the reason behind Chandrababu's silence lies in his plan for attack, he said that the culprits behind the murder attempt would be revealed if the attacker's call data was released. "Within half an hour from the incident, AP DGP RP Thakur gave a briefing which was in a way targeted at intentionally sidelining the probe. The police are being partial in their approach to the case. Why is it that the government is not coming forward with an independent probe on the incident?" he demanded to know. 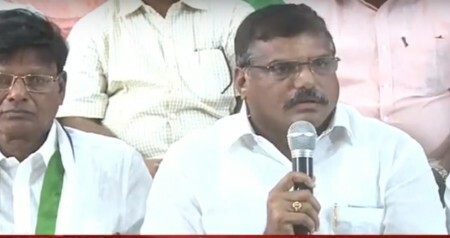 Stating that the YSRCP had full confidence in democracy, he said that he had no belief in the State government. A third party investigation should be initiated to unravel the truth in the matter, he demanded.